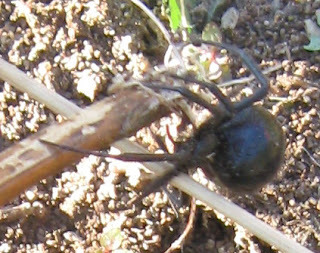 I encountered this Black Widow spider a few days ago while volunteering at Accokeek Foundation's EcoSystem Farm in southern Prince George's County, MD. A group of us found out that turning over the farms large compost pile was an adventure in survival. 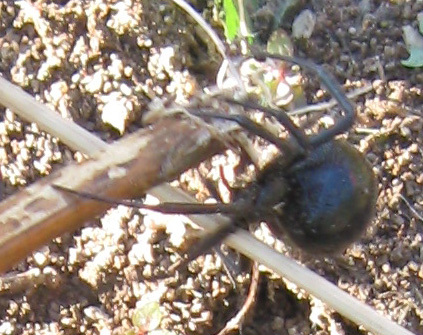 This Black Widow had many sisters. I'm not generally afraid of spiders and gladly share my living space with any that will consume mosquitos and other unwanted insects. However, I was only too glad to be quickly done with that chore and to be able to breathe easy that none of us was bitten. If you ever meet one of these ladies face-to-face, you won't forget it. Impossibly large, shiny and bold, she is glamorous, mesmerizing, and truly frightening. Be sure to check out the photo gallery of poisonous plants taken on our walk-about including Nandina and Hydrangea (both produce cyanide!). To read more about dangerous plants, see Amy Stewart's book Wicked Plants, our October 2010 Enews issue and our current issue of Washington Gardener Magazine. Fall 2010 issue of Washington Gardener printed and mailed! 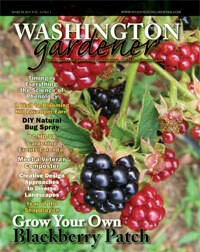 Our Fall 2010 issue of Washington Gardener Magazine has printing and mailed this week. If you are a current subscriber, look for it in your mailbox soon. 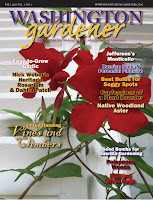 The cover story is on Vines and Climbers. 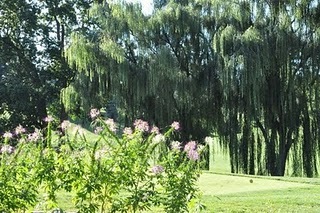 There is a listing of over 20 vining plants that do well in our Mid-Atlantic gardens. 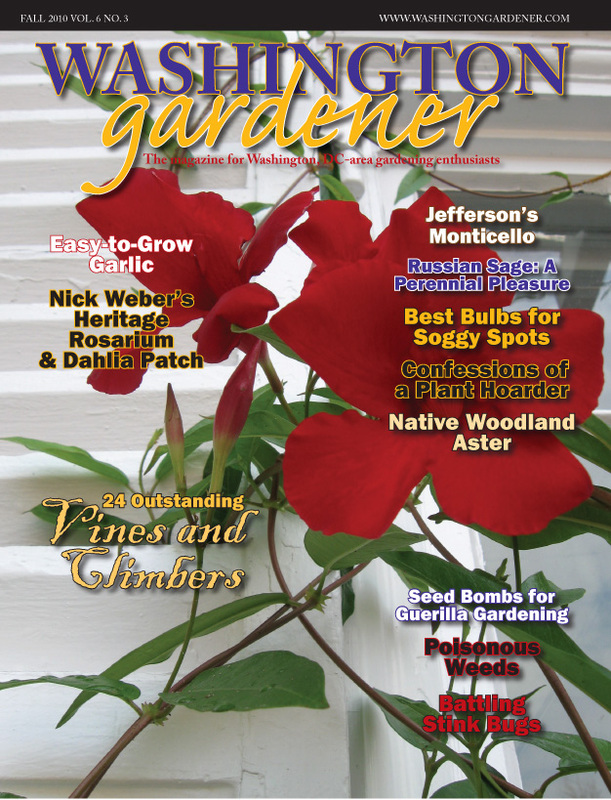 Also in this issue is the tantalizing Edibles column, “Easy-to-Grow Garlic” by Cindy Brown. She shares her tips on how to grow garlic here in the Mid-Atlantic and the best varieties for our area. Our Daytrip is to the Monticello, Jefferson’s famous residence outside of Charlottesville, VA. I visited there myself this past summer and have to say his vegetable garden is impressive. 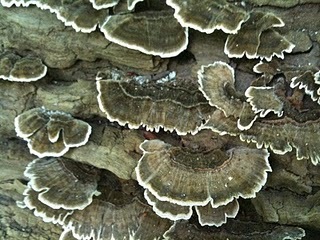 To subscribe online, see www.washingtongardener.com/index_files/subscribe.htm and use our PayPal credit card link. Or print out the form posted here (http://twitpic.com/2xko3m) and mail it in with your check. You can also buy the single issue at various local stores such as Borders in the DC-area, the USNA Arbor House, Natural Art Garden Center, and many others. Finally, see our table or magazine staff at upcoming local garden events. Find us next at the Nov 15 Silver Spring Garden Club and Nov 17 Takoma Hort Club meetings. Tap us on the shoulder to buy the current issue or start a subscription. Speaking of Seed Saving, our dual Seed Exchanges are set for early 2011. In the drab, dreary heart of winter, join us for seed swapping, expert speakers, great goody bags, and much more. Save these dates: January 29, 2011 at Brookside Gardens in Wheaton, MD and February 5, 2011 at Green Spring Gardens in Alexandria, VA. Registration and full details will be posted in early December. Our DC Urban Garden talk series with the Historical Society of Washington, DC (HSW) has been cancelled. • On Monday, January 17, you can see Michael Twitty on “In Search of African-American Heritage Seed” at the Silver Spring Garden Club meeting at Brookside Gardens, Wheaton, MD. Please keep checking in with us for details and future talk updates. The Newark Street Community Gardens was started in 1974 by local resident Ann Chase as part of National Food Day in 1974. It is located on DC Parks and Recreation land, atop of water tributaries including the Fourth Branch that flows into the Chesapeake Bay watershed. This 4.5 acres community garden, has 220 plots, 80 trees and 25 different bird species, (and crickets) against the backdrop of the National Cathedral. About 10% of the gardeners live outside the neighborhood. Mary (pictured here with her straw hat with a sunflower pin) of Newark Street Community Gardens has been planting there for some 10 years, ever since her trees in her backyard grew up and shaded it. This was a hard summer for her and her fellow gardeners. However, her zucchini’s did well, and she just finished planting seeds of lettuce, arugula and cilantro fall’s cool weather and harvest in a month or so. Her garden is still full of zinnias – pinks, fuschia, yellow, red, orange. In Ward 2, Frances Community Garden can be found behind the Francis Stevens school and the Francis Community Pool, overlooking the GW Parkway. Just about two dozen plots (5'x25' or 10'x25') line up along the edge of the field, overlooking the GW Parkway and the Potomac creek canal running alongside. These plots are on DC land – specifically of DC Parks and Recreation. Imagine gardening on a hot summer day – while hearing squeals of joy from the pool and from the new school playground (with yellow slides, red ladders) and the running water of the Potomac creek along the commuter traffic! This is truly a community garden in Washington. DC. Searching for people, plants and plots!!! 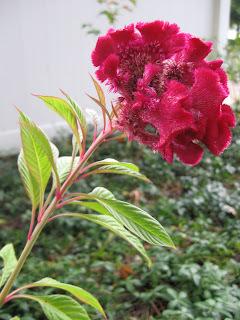 Contribute to this new guest blog series about DC’s community gardens, contact me at susigbf@yahoo.com. 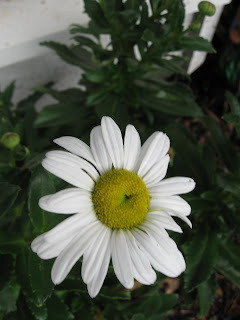 It is Garden Blogger Bloom Day again -- the 15th of each month -- when we garden bloggers say what is blooming in our respective gardens then link to each pther and post centrally to MayDeamsGardens.com. It was pouring rain yesterday so I ran around inbetween the drops and snapped just a few photos for today's post. In the gloom, it is no surprise what stood out to me but these two red blooms and one white one. 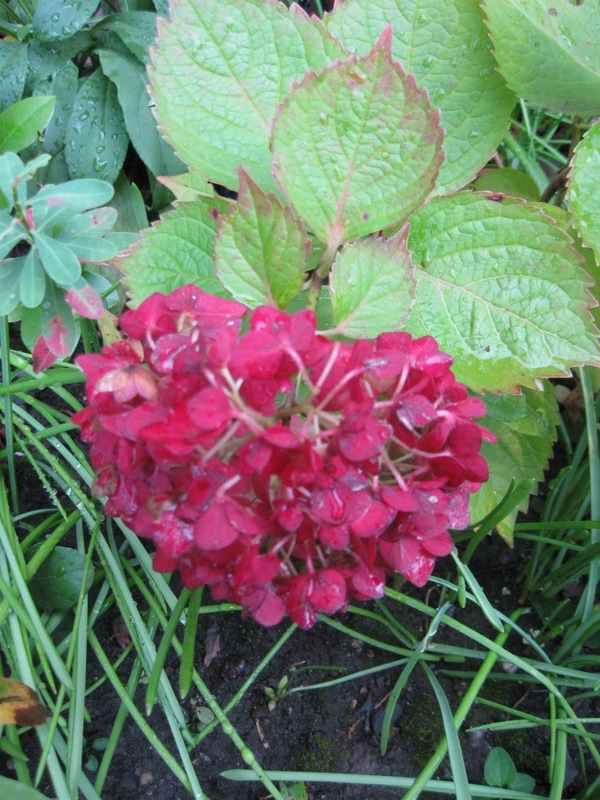 First is the Hydrangea 'Pink Shira,' which is the truest red of any hydrangea I am trialing -- even those that are supposed to be lipstick red do not compare. The color on mine may be influenced by the alkaline soil, as it is planted a few feet from a brick wall. 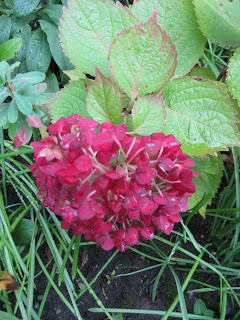 So your color mileage may vary if you have the same hydrangea in your garden. Second is the "feely flower" or at least that is what my younger niece calls it and she gets quite exapperated when I don't know that she is talking about Celosia (Celosia cristata) aka Coxcomb or Cockscomb. To me, "feely" means Lamb's Ear. I think of this one as the "brainy" flower and associate it with Halloween timing. Third is the Nippon Daisy aka Montauk Daisy (Nipponanthemum nipponicum aka Chrysanthemum nipponicum and Leucanthemum nipponicum). I had never grown it before and got this plant at a garden club swap last month. It is in a sunny spot next to my gazebo. I'm eager to see how it does next year and if it proves as low-maintenance and hardy as its tag promises. • Try one of the various polymers on the market, such as SoilMoist. When you plant up your containers, mix the polymers in with the potting soil. Follow the directions for mixing and proportions exactly — a little goes a long way. • Already planted up all your containers? It’s not too late to add polymers now by gently poking in a pencil near the roots and adding the hydrated polymers in the hold. This works for planting directly in the ground as well. If you have a plant that is especially thirsty, add polymers around the base of it so you do not have to water them so often. • Install a rain barrel. You can make one yourself at numerous area workshops or purchase one from a garden supply company. (See related story on next page.) Use it to hand-water any container plants. Mine seem to greatly appreciate rainwater versus the chlorinated tap or hose water. A rain barrel at each downspout can save hundreds of gallons of water per year. • Bring a bucket or two in the shower with you. Collect the water you run to get the temperature right and your rinse water to dump on your thirsty plants. This latter, soapy “gray water” actually provides a bit of bug-resistance to your plants, as well as giving them a good drink. • When watering with a hose or watering can, aim the water at the soil. No need to drench the plant. Wet leaves can actually invite fungal diseases. Soak the plant root zone. • Measure and time your watering. Set a kitchen timer or put out cleaned tuna cans to keep track of how much you are doing each time. Optimally, you will water your garden and lawn just once or twice a week and give it a good, slow, long drink of 1-to-2 inches total. Don’t forget your trees! Young trees need 25 gallons each, according to Casey Trees. • Invest in soaker hoses, flow timers, and extra water outlets to make your task easier and more precise. No need to over water or let the excess flow down the sewer drain. Sprinklers that spray the sidewalk and pathways do nothing for your plantings. • If it rains more than an inch in any given week, don’t water your lawn and garden that week! Override your timers if you have them. Nothing is more wasteful than having lawn sprinklers going full blast during or right after a good rain. • Make a point to check your container plants daily. They dry out much quicker than those in the ground and may also be blocked from receiving direct rain by porch roofs or other obstructions. • Make a drip irrigation system out of recycled soda bottles. This is perfect for watering your containers while you’re away for a time. There are many sources of directions for this project. I found an especially easy-to-follow one you can make at yougrowgirl.com. • Look for other water sources around your home. I often dip a watering can into my pond and give my tomato plants a nice, healthy dose of fish-fertilized water. 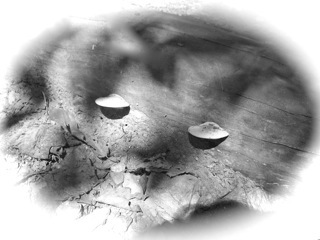 • When you clean out your birdbath, dump the old water on nearby green things. • When it really rains during a summer storm, your rain barrels can fill in minutes, so put out a few extra containers to collect that overflow as well. • You may be able to connect a hose to your clothes washer, dehumidifier, or AC unit to re-use that gray water for indoor and outdoor plant watering. 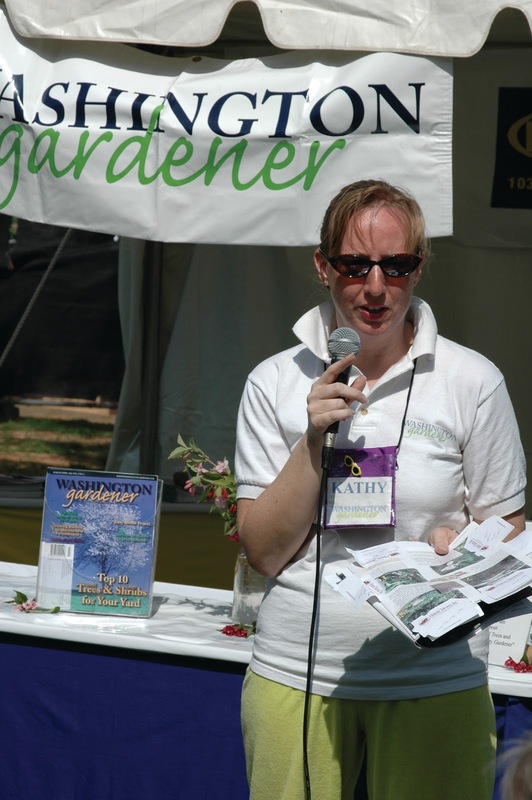 Kathy Jentz is Editor/Publisher of Washington Gardener Magazine. Se gets her daily weight-lifting workout by carrying loads of rain barrel water to all her hanging plants throughout the summer. She can be reached at Wgardenermag at aol dot com. Social Media Friends Sale — 10% Off Subscriptions! Announcing the Social Media Friends Sale as a Thank You to all Washington Gardener Magazine followers on Twitter, Facebook, and on this Blog! As of this week, we are at more than 2,000 Twitter followers and over 530 FaceBook page friends. 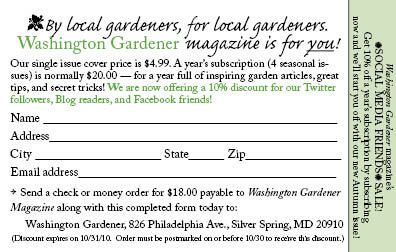 Get 10% off new subcriptions to Washington Gardener Magazine through 10/31/10 using the form pictured here (click on it for full size image and to print it out) or you can access it at: http://twitpic.com/2xko3m. Those cute National Zoo pandas' favorite treat is also one of the most versatile and useful plants in the garden. Bamboo is underused in the Washington metropolitan area and is saddled with a bad reputation. It deserves a second look and a more accurate understanding of its better qualities. or pick up the print version in person for free at the many dropbox locations around Takoma Park, Takoma DC, Silver Spring, and Kensington. After a wet spring and blazing hot summer, this should be one of the most colorful and beautiful autumns in recent history for the greater Washington region. The leaves of the sugar maple, ginkgo, and sweetgum trees will be ablaze with the fiery hues of fall. Now is the perfect time to take a look around and evaluate your own home landscape. Could it use a bit of fall color? or pick up the print version in person for free at the many pick-up locations around the Washington, DC region. D.C. Schoolyard Greening, in conjunction with community partners, sponsored its fourth annual DC School Garden Week student photo contest. Any D.C. K-12 student was eligible to submit a garden-related photograph. The panel of judges this year included garden and photography experts: Kathy Jentz – Editor/Publisher of Washington Gardener Magazine, Susan Harris – Garden Coach and Blogger, Christa Carignan – Garden Blogger and Photographer, and Lisa Helfert – Professional Photographer. Winning entries were announce at the DC School Garden Week 2010 kickoff event today and are posted below. Congratulations to all the DC School Garden photo contest winners! UPDATE: I have an album from the DC School Garden Week kick-off event posted on the Washington Gardener Magazine FaceBook page. It includes the photo contest winners. Category C (Grade 6-8) had no entries and so no winners to report. Need a Great Garden Speaker? I’m part of a new speakers bureau called GreatGardenSpeakers.com. Our goal is to make it easier for garden clubs, botanical gardens, and other groups to find the kind of high-quality speakers they are looking for. I’m writing to let you know about the site and to ask for your help in getting the word out to other groups who book speakers. • GreatGardenSpeakers.com is completely free for you to use and doesn’t require you to sign up or give any personal information. Speakers pay a small fee to be listed on the site. • You can search for speakers by name, topic, or category. We have also created a special “Coming to a City Near You” feature that lets you search for speakers who either live near you, or who might be traveling to your area in the future. This might allow you to save on travel costs and speaking fees by booking a speaker who is already in town. • Audience members have the option of posting reviews of speakers they have seen. This provides a way for garden clubs and other groups to recommend the speakers they have enjoyed the most. I encourage you to visit the site post reviews of any speakers you have heard! • GreatGardenSpeakers.com does not act as an agent or go-between. Once you find a speaker you’re interested in booking, you can contact them directly to make the arrangements. • We offer a free email newsletter to keep you updated on new speakers that have joined our group, new topics or book releases, and other news you can use. 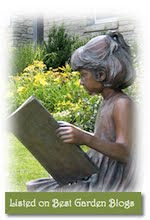 Sign up for the email newsletter at: www.greatgardenspeakers.com/content/newsletter.html. If this sounds interesting to you, please visit http://www.greatgardenspeakers.com/content/venues.html to see answers to frequently-asked questions. 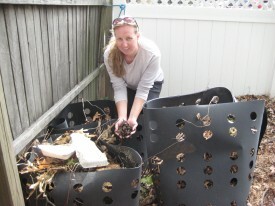 "Composting has long been hailed as one of the best ways to reduce, reuse and recycle. Orange peels, potato skin and coffee grinds always make it into the compost bucket. But as Rebecca Sheir finds out from Washington Gardener Magazine’s Kathy Jentz, you can compost your pee, too. Seriously." Gardener Kathy Jentz says you can compost urine... and any waste, provided it isn't from a meat eater. Our September 2010 Washington Gardener Magazine Reader Contest winner chosen at random from among the submitted entries is Danielle Bays of Washington, DC. She will recieve a $60 gift certificate from CSN Stores (http://www.csnstores.com/). CSN Stores has over 200 online stores where you can find everything from stylish handbags, to modern bar stools, or great cookware! CSN Stores has an extensive Patio & Garden collection. Turn your backyard into an outdoor living room with their impressive selection of outdoor furniture. Looking to enjoy the great outdoors? Check out their camping gear, binoculars, and optics in our outdoor recreation section. Love to grill? Browse their outdoor cooking for the best in barbeques, smokers, and grills. Lucy G. of Annapolis, MD, picked Hosta 'Paul's Glory. "'This hosta, one of my favorite varieties all season, stays looking good straight through until Halloween, at a time when my others are looking slug-damaged, or like they're just tired out and about to go dormant. Even in November, when it does start to turn, the leaves turn gold instead of just going brown and withered. It's not huge but is large enough to have real "presence" (foliage is about 24" tall.) It really is a good perennial accent in a fall garden." Danielle B. of Washington, DC, said, "My favorite fall foliage plant is the quaking aspen tree. I lived in Santa Fe, NM, for a number of years. In the fall, the foothills of the Sangre de Cristo mountains would be blanketed in golden yellow. Beautiful. Unfortunately, not a look I will be able to replicate in my Washington, DC garden." 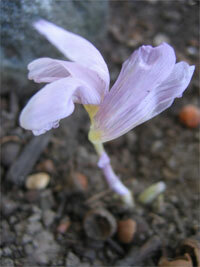 Jeavonna C. of Baltimore, MD, shared her pick, "Fall Blooming Crocus & Colchicum (pictured above). 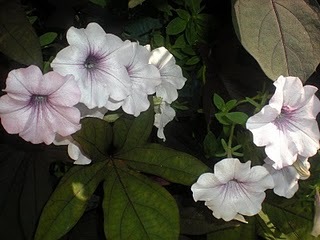 They are beautiful and a nice frame (early spring, late fall) to my changing garden picture." Madeline C. of of Washington, DC, said sedum. "I love the rust colored flowers." Gloria S. of Silver Spring, MD, nominated Fothergilla. Katie D. of Towson, MD, selected Acer saccharum- Sugar Maple. "The glowing yellow color really outshines any other tree in the fall foliage show." George G. of Falls Church, VA, chose Nandina domestica 'Monum' Plum Passion. "This shrub has three distinct color phases. New growth is deep purple. In summer the leaves turn deep green and in fall-winter the leaves become reddish purple. The color is outstanding unless we have a very cold winter and the leaves defoliate but will return in spring." Molly G. of Alexandria, VA, wrote, "My favorite fall foliage plant is the hardy chrysanthemum. They come in such bright happy colors and cheer up the yard in which everything else is dying off for the year." 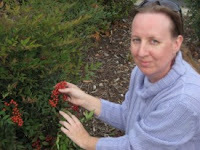 Miriam B. said, "My favorite fall plant are my roses. After a long hot summer I love to watch the final flush of blossoms and the aubergine and lime colored leaves sprouting new growth on the spindly canes of the long summer withered rose plants." Mavis B. of Silver Spring, MD, wrote, " My favorite fall foliage plant is my Ginkgo biloba tree. The fan-shaped leaves turn a brilliant yellow that is so remarkable that total strangers stop to take pictures of it. Pretty good for a tree of ancient origins!" So, did we miss YOUR Favorite Fall Foliage Plant? As part of The Cultural Landscape Foundation "What's Out There Weekend" in Washington, DC, last Saturday, I decided to stop by the Smithsonian gardens afternoon tour. I was downtown anyway at the National Book Fest and decided even if I had been on several tours of Smithsonian grounds lately, I might be able to learn something new. Turns out I was the only taker for that 1:00pm time-slot. They had a few show up for the morning one, those being the smart folks who wanted to beat the sun and heat. 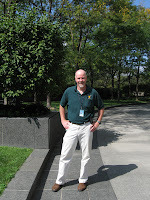 Since it was just my tour guide, William J. Donnelly, Smithsonian Institution landscape architect (pictured here), and I, it was without guilt that I directed the tour to be of the only grounds on the National Mall I had never toured previously: the Hirshhorn Museum of modern art and its adjacent sculpture garden. The museum and sculpture garden opened in 1974. Originally, the building was to be clad in pink granite and that would have softened its Brutalist style a bit. As with many projects, money ran out for that and also the plaza plantings. William pointed out the recent stone work upgrades on the museum plaza entrance area. Black granite replaces sections of textured concrete that have worn out. Pebble paths have been replaced with brick and other stonework. Pebble paths are a maintenance nightmare for high-traffic areas. Ramp access has also been added over the years to both the museum plaza and to the sculpture garden now allowing stroller and wheelchairs to enter both. I wondered out loud why the sunken sculpture garden did not connect to the museum itself. (It is across the road on the Mall.) William said it did, but that there was a problem with vagrants using it and the tunnel connection quickly closed. He noted that there were talks to re-open that access point. I certainly hope they do and put that on a priority list. The disconnect between the two parts of the museum has always struck me as odd and unnatural. 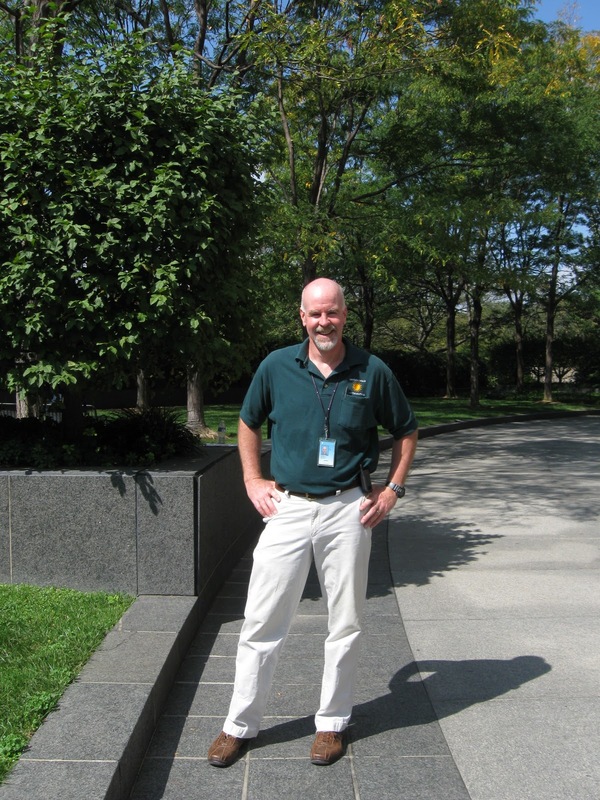 The sculpture garden has several other problems, William noted. Among them, it is 15 degrees hotter down there than the rest of the Mall. We frequent visitors know just how hot and exposed the National Mall is on a normal summer day, imagine these windless gardens, especially before the newly planted trees had a chance to fill in! One of the architect's original plans that never saw fruition was for a reflecting pool, echoing the one by the Washington Monument, to extend out from the Hirshhorn museum steps across the road and deep into the Mall. That was axed and instead there is a large water feature in the middle of the sculpture garden. I remember visiting as a kid in the mid '70s and getting yelled at by the guards for fishing coins out of that very fountain. They are just lucky I did not jump in too given how bleak and hot it was at that time. I'll be curious to follow the plans of the garden renovation and see how it develops in coming years.